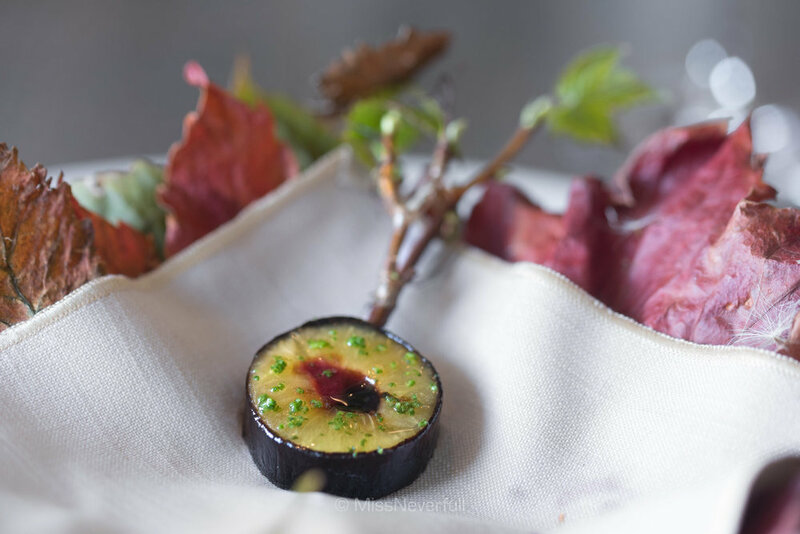 Although the Italian Chef Massimo Bottura has taken the crown of World's 50 Best Restaurant 2016, Noma, the winner for four years in a row (2010-2014) is still mentioned as 'the best restaurant in the world' till now. 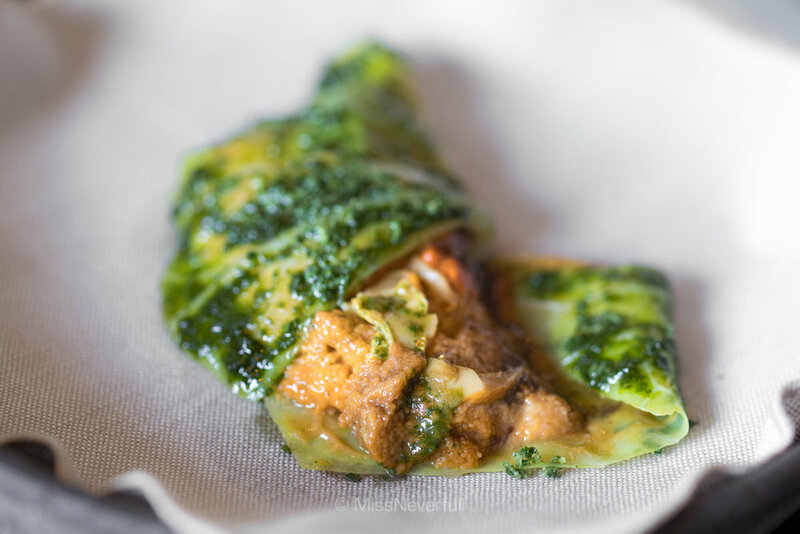 Chef-owner René Redzepi as one of the most influential chefs in the world, has unquestionably took Nordic cuisine to world class and still ruling the restaurant industry in Copenhagen. It is no more a surprise to hear someone travels from another side of the planet to Copenhagen just for Noma, like me (or us). The reason that simulated me to make such a fast decision is the relocating of Noma in 2017 to a new peaceful suburb in Christiania. For the same reason, you will never know how hard is it to get a reservation unless to have tried by yourself. Lucky me, a confirmation email from Noma drove me to Copenhagen to eat. Almost over a two months waiting and i am finally here. My dearest dining partner travelled all the way from Sydney to Copenhagen which is even a longer trip than mine, she had been to Noma's pop0up in Tokyo once and three times with Noma Australia, but this was my first time with Noma as well as hers with Noma Copenhagen. We were both so excited about all the fantastic things gonna happen at Noma as we expected. Having been lived in Singapore for several years with abundant sunshine everyday, i never imagine that the weather in Copenhagen was horrible in early October. It was cloudy and windy for almost everyday we were in Copenhagen, expect the day we went to Noma. Warm sunshine with a soft breeze of early Autumn. I arrived a bit earlier than the reservation time at noon, the reception young lady was already waiting for the guests outside. We had a lovely chat while i was waiting for my partner to arrive. I never expected our conversation could be so casual, natural and enjoyable although we have never met before. Thanks chef Rene for a concise and warm letter. I am sure this big family still serves their best even when the 'god' is not here. Anyway, let's start from here. Omakase. Soon after we seated, we were displayed some of the fresh ingredients gonna be used in our dishes - king crab, sea urchin and lobster. 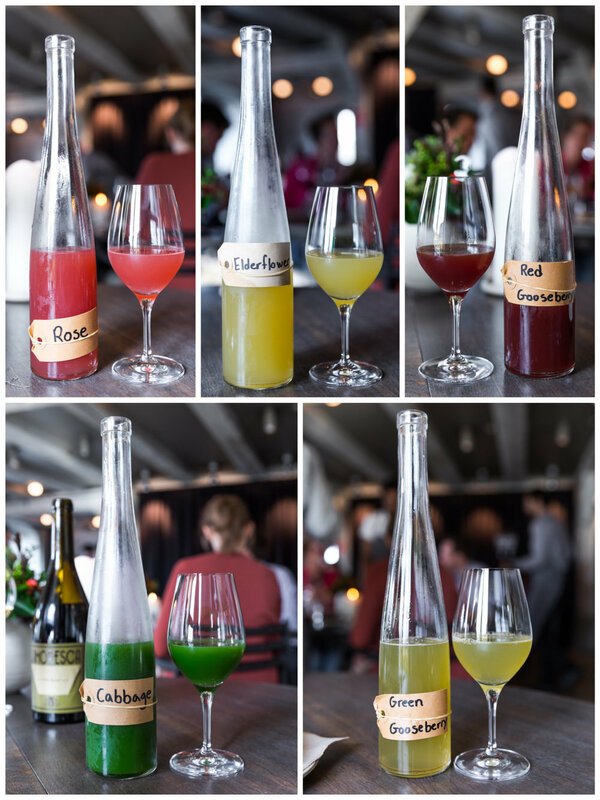 Noma is not only famous for their modern Nordic creations but also for juices. 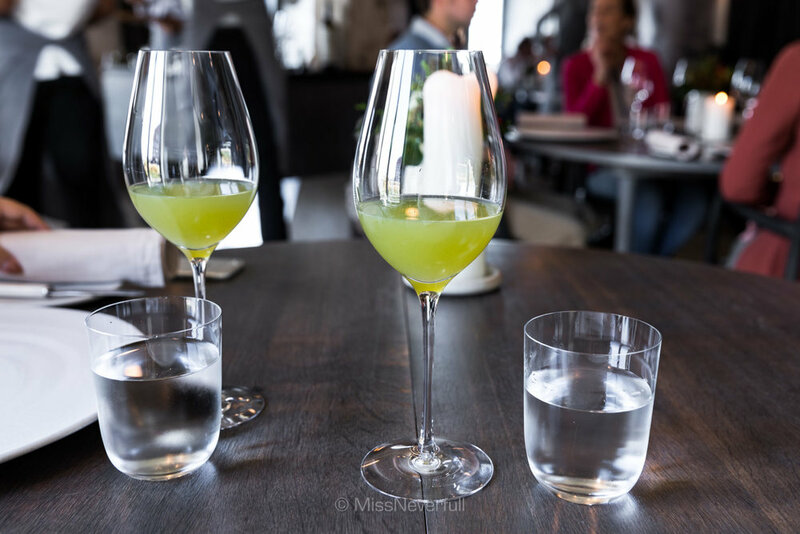 A glass of healthy green juice of topaz apple, kafir lime, lemon and verbena to greeted us before the arrival of the first dish. Balanced acidity and a hint of sweetness from with moutful of fruity flavors. We both deicided to have juice pairing to match our meal, my partner, a wine lover, also had half wine pairing. The first dish was absoutely as beautiful as you see. Name the first apple of the new season, it was crispy and refreshing like the new borns. The sauce inside the apple was made of fermented apples, very clean and has a sweet breeze inside the sour flavors. 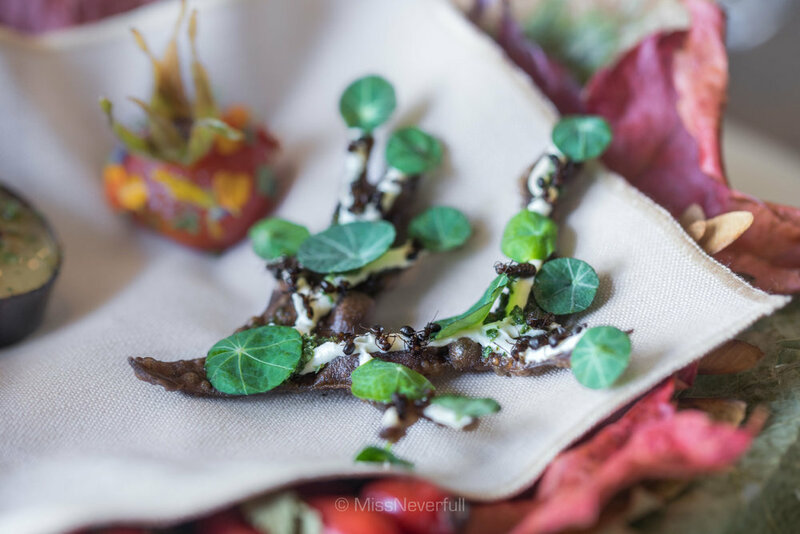 The second dish brings a stronger sense of the season, featuring four snacks include Nasturtium stuffed with black currant berry (left bottom), Malt flatbread & ants (right bottom), Roseship filled with berries and Reeves plum with kelp skin on the back. This was not my first time eating ant but still so excited to have this cute crispy flatbread with so many ants. Franckly speaking i was a bit worry too, because i also had a dish with a lot of ants at Kadeau (actually one of their signatures) last night but it was sour to die - not the sourness of the ants but from all the other ingredients. Hopefully Noma as the leading restaurant that serves ants to add the acidity certainly did much much better here. The radish pie was equally pretty as the previous dishes. The tart base was crispy like a cracker, topped with crunchy pickled radish with a clean taste. Followed by the new baby corn grilled at the backstage of the kitchen (you will see later in a tour into the kitchen), The corn was grilled nicely with a smokey flavor, its mild sweetness matches well with the savory of the horseradish cream. Bread service in Copenhagen is always an exciting part for all the healthy bread lovers like me. Crunchy crust with a soft and chewy center with creamy butter, yum! One of the highlights of the meal was sea urchin and cabbage. Most uni dishes i have had were in Japan, and i never imagine such a combination before. Possibly the best uni i have had recently, so creamy and sweet to marry the crunchy cabbage. Next was another beautiful dish of langoustine with aromatic lavender. The aromatic works unexpectedly elegant with the umami langoustine. 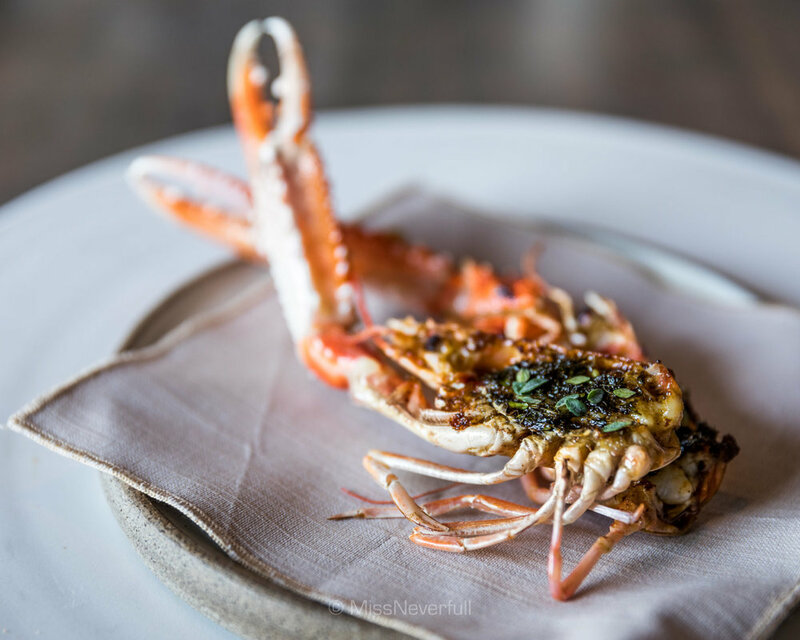 To continue, grilled langoustine's head was served, the distinct crunchy textures and flavors equally impressed us. Next to arrive was steamed king crab in a creamy egg yolk sauce. The naturally umami and mildly sweetness of the crab was nothing but delicious, the egg yolk brings extra creaminess and umaminess to the dish, this excellent combination left a mouthful of sweetness and divine tastes. Before being served the main course - whole grilled wild duck, we were displayed the cute baby duck going to be shared by two of us later on. Then we had a plate of grilled bitter greens to clean our plate to get ourselves prepared for the duck. The green platter consists of 11 kinds of greens that had been grilled and served with a scallops paste. As pure Asians, we were pretty surprised to see duck head on our plate which is rarely served in western countries. The brain was creamy and marvellous, i even finished the crispy bones of the head like crackers. The duck was no doubt wonderfully grilled, pretty succulent and flavorful. The dish was served with a plum sauce and cabbage wrapping which reminds me of Peking Duck but a much healthier Nordic version. The plum sauce was quite sour for my liking and the bitterness of the cabbage was kinda bitter, i prefer the eat the duck it own. Ants in dessert? Yes. Nordic diaries never fail to satisfy me, the sheep's milk curd was very fresh and light. The creamy ant paste brings a touch of acidity to balance the milk curd. This is something new to me as a dessert dish, frankly speaking i was not very into it but it was quite interesting. In comparision, the lovely black currant and wood ice-cream better matches our taste buds. Inside the coated roasted nutty caramel 'Kanini' was ice cream with a hint of black currant. It was beautifully topped with some wild flowers to added some bitterness to balanced the sweet and creamy ice cream. The last dessert consists of two parts. I loved the moss cooked in chocolate which was deep-fried to crispy, the cocoa flavor was strong but not too bitter . On the side was some cute choclate 'cep mushrooms'. Egg liqueur was a quite strong alcoholic pairing to the chocolate, very creamy but kinda overwhelming. This was definitely a remarkable meal i have had in Copenhagen, unique, playful and tasty food. The service was impeccable to qualify for its reputation, incredible friendly people and incredibly relax ambiance. While frankly speaking, i don't think this is 'the best meal' i have ever had or name Noma 'my favorite/the best restaurant' in the world. 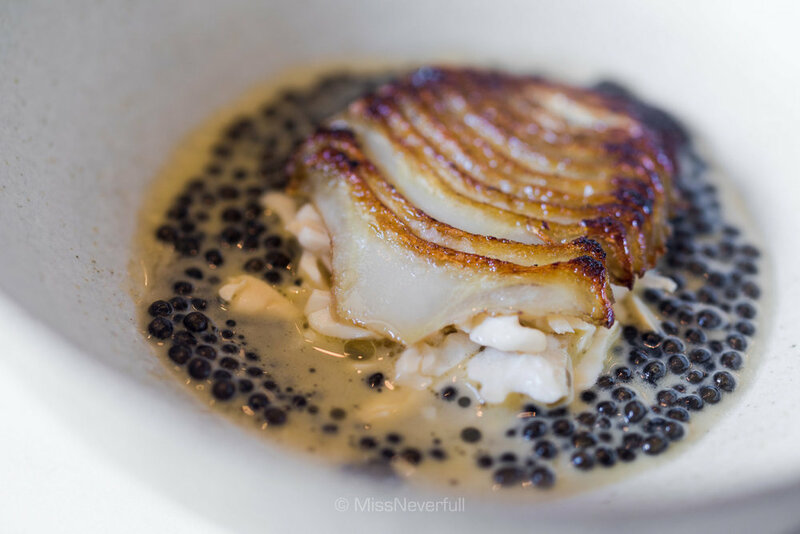 It is hard to judge the BEST as food is a very personal thing, and different menu or ingredients will definitely affects your experiences.Although it is hard to compare different types of restaurants but at least for me, Geranium better matches my taste in this trip. I really appreciate the fantastic team with over 100 people behind the meal, and of course the father of Noma Rene even he was not there. Cannot wait for the new Noma 2017! Hours: Tuesday – Saturday Lunch: 12.00 p.m. – 4.00 p.m., Dinner: 7.00 p.m. – 00.30 a.m.